Home > Investor Relations, Private Equity and VC	> Do LPs buy funds the same way we buy (or try to buy) TVs? Do LPs buy funds the same way we buy (or try to buy) TVs? 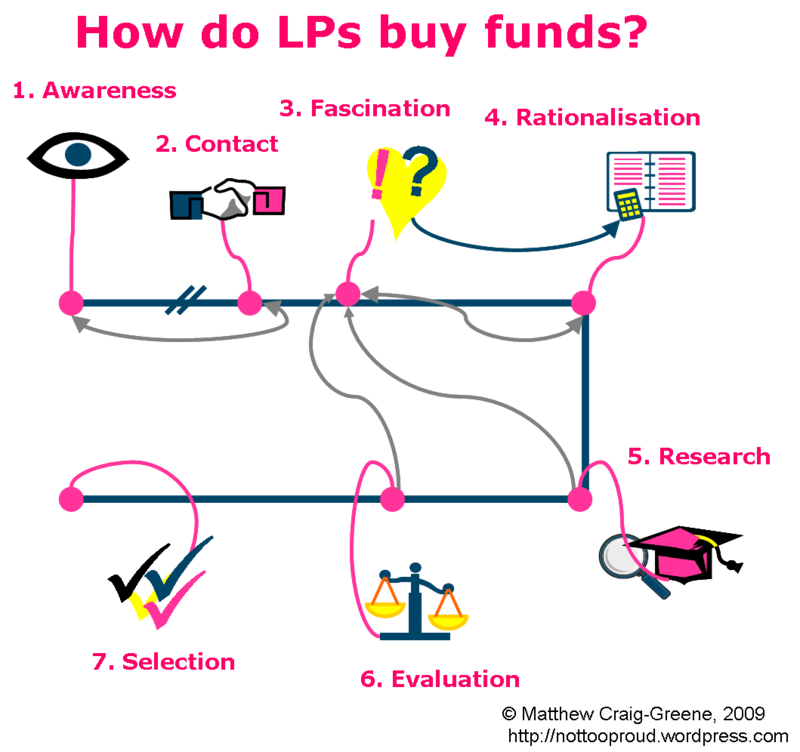 Laid low at home earlier this week, suffering from a thankfully improving bout of self-inflicted food poisoning, I found myself wondering about the thought processes that are involved in an LP making a commitment to a new fund. This manager is the most able to successfully execute that strategy. I may have given the impression that I believed that this was all that was necessary to secure an investment, but of course that is not true. The fund selection process is more sophisticated and the biggest challenge for any fund (but particularly a new fund) is going to be convincing an LP that the time required to properly investigate the fund would be worthwhile. It is all very well lining up watertight arguments and detailed corroboration, but what good is that if an LP doesn’t get past slide five in your pitch book or doesn’t pick up the PPM? Not much good at all, of course. Stating the rational case for investment is probably only going to pay dividends once the emotional curiosity of an LP has been awakened. I think it has a lot to do with awakening fascination, emotional curisosity in the investment opportunity, the investment strategy, or the management team. In order to evaluate the likely future performance of a fund, an LP cannot rely on numbers alone. When an analyst is picking through 50 PPMs, which are the ones that are going to get the most attention and stand an improved chance of being presented to the investment committee? The fascinating ones, of course! In all likelihood this fascination with the fund will be rationalised into a more empirical analysis of the benefits of investment. In fact, as the selection process becomes more abstracted from the initial contact with the brand and due diligence begins in earnest, the emotional impact of the brand actually becomes less important. We select the funds we want to invest in emotionally and assess whether we can invest in them rather more rationally. In essence, the idea is that most investment opportunities progress by awakening an emotional interest that is then rationalised, before being checked against certain other criteria, including competing investment opportunities. The amount of time that passes between the individual steps can vary between simultaneity and years. Matt thinks that the TV would look cool on the living room wall. It’s so shiny! Matt decides that buying the TV and fixing it on the wall would mean that he could get rid of the old CRT TV and the ugly TV stand…that would mean space for an extra chair in the living room and a more comfortable time when friends come over – how practical! I like your TV example. It fits perfectly with my proposed purchase of a Range Rover – particularly the committee stage. That stage was very familiar. I couldn’t help thinking of the “Purple Cow” effect. Make your PPM remarkable in both presentation and in content. And the emotional investments we make as humans trumps the rational a lot of the time. If someone becomes emotionally captivated by a PPM, the rationalization for the investment is easier to make. Thanks Charlie – and I agree with you. Investment selection can quickly become an abstracted process, so that those making the final decision may be removed from the initial contact and “fascination” with the fund. It is therefore doubly important that the impact made on the “internal messenger” is profound – and profound impacts are always emotional rather than rational…of course you are about to have the most profound emotional experience of your life pretty soon a little bird (it was a Crowe) tells me! Don’t underestimate the power of momentum too. I’ve seen quite a few transactions (indeed, I’ve been the buyer myself) where the momentum of the transaction overtakes the pricing, so that you go into what sounds like a great transaction, then the scope changes as you customise the product and negotiate the price until, finally, you are getting what you want but not at the outstanding value price that you intially identified. But you still go through with the transaction in the same emotional state as when you had first identified the bargain, but now it’s no longer a bargain. It’s what leads to that sinking feeling shortly afterwards where you feel that you could, perhaps, have done better if you were more assertive – or had the guts and presence of mind to walk away. In an industry like PE where you make your money by buying well, rather than selling well, this emotional momentum can be a real trap. Perhaps self-awareness training, or a good therapist, is an essential business tool in PE and VC. Interesting point, but I think that the abstraction you get during the latter stages of a fund investment mean (should mean) that you need one hell of a lot of momentum to make it to the finishing line. On the deal side of things, it would be hard to argue that some deals haven’t been done because they seemed like such a good idea at the outset…not best practice, obviously! Nice post. The idea of presenting a fascinating opportunity, strategy or managerial team has often been expressed as “differentiation”, but I think your word choice is more appropriate. As a GP and LP, I find that simply being different is often not sufficient to attract interest. Put another way, being different does not always produce fascination, while fascination is typically the result of at least perceived differentiation. Subtle point, but I believe important conceptually. Thank you very much for sharing your thoughts. In our everyday lives we find it difficult to be truly gripped by anything we have seen before and, in that regard, I do think differentiation is at least an important component of, and probably is a prerequisite for, fascination. Fascination, of course, is only at its most powerful when it can translate to a genuine need, if it can help us achieve a goal; in other words, I wholeheartedly agree with you! When it comes to knowing the future, anticipating which funds will deliver the returns after which we hanker, I think it is disappointing if not wholly unsurprising that a particular onus is placed on what happened in the past; it is a sad truism that no one was ever fired for investing in a fund that outpaced its rivals in a previous iteration. Perhaps LPs find themselves, today, uniquely placed to “take a risk” and invest in the fund with the greatest potential, rather than that with the greatest track record, track records being what they are, right now. But we have to accept, and embrace, the fact that we often base our decisions on our own experience or the experience of others: when did you last pick a restaurant without previously checking what others had thought when they visited maybe months previously? Why do we choose to send our children to schools that have exhibited superior performance in the past? Why do we trust that our next Reese’s cup (I’m sharing too much, here!) will be as good as the last? When we don’t know the outcome, we almost always base our expectations on historical data, rightly or wrongly. I think we need to think about the difference between interesting and fascinating, and differentiated and revolutionary. – The plasma screen TV in a world of cathode ray tubes. And, almost by definition, ideas like these have no historical performance to prove their mettle. Thank you for your comment, Damian. I think the way that VCs evaluate a potential investment opportunity and the way that an LP may evaluate the idea of investing in a VC’s fund are a little different: whereas a VC (if not a buyout house) will (often!) be looking for the home run opportunity, an LP will have a more balanced (you might call it conservative) approach. Whereas the VC might make 15 investments from this fund, an LP invested in this and maybe 15 to 100 other funds (or possibly more, through funds-of-funds structures) will typically have exposure to many, many more underlying investments. In other words, the risk/reward targets of VCs and LPs are fundamentally different. Do buyouts need more bad PR? At least the PE house is not at fault here! Does Private Equity “get” social media?